With our consultative approach to helping clients solve a wide variety of technical business challenges, we found, over time, that many businesses kept encountering the same types of obstacles. Very often, these hurdles were caused by gaps in their software. In response, IMAGINiT developed utilities and software products to bridge those gaps and to help companies work more efficiently. These offerings enable firms to get more from their investment in existing tools and eliminate time consuming elements from design, documentation, collaboration, and construction processes. Collaborative Project Management. IMAGINiT Clarity and IMAGINiT Clarity Connect help firms easily share information within the organization and with other business partners. No matter where people are located or their level of Revit expertise, progress on projects can continue. Data Management. IMAGINiT Utilities for Vault Server and for Vault Client help solve issues related to backups, lifecycle change notifications, pdf creation, and more. Building Design. Scan to BIM takes Revit point clouds to the next level, while IMAGINiT Utilities for Revit eliminates pesky problems like room and element renumbering, changing case, and other inconveniences that slow project teams’ productivity. Civil/Survey. 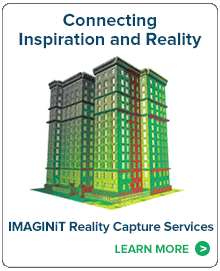 IMAGINiT Utilities for Civil 3D are designed to help teams get more from their everyday use of Civil 3D. Beyond these tools, we have also created partnerships with complimentary solutions providers such as Leica Geosystems and – through our Rand Facilities Management team – ARCHIBUS. These offerings include tools and systems that we found our clients needed and enable us to be a one-stop for nearly all our customers’ design technology needs.